While in Myrtle Beach, we were actually staying right at the beach. This morning, we took advantage of our beachside location and drank coffee overlooking the ocean. 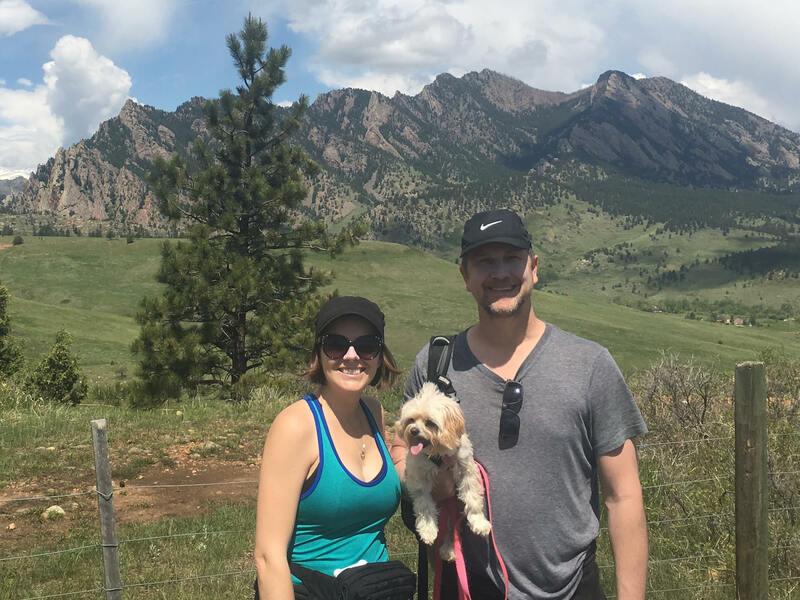 After living in Southern California for five years, we had been missing the beach. Even though the weather was somewhat grey and dismal, we still relished the water views. We were looking forward to see Myrtle Beach but were shocked to see how rundown it was with shady looking motels and no shops or restaurants along Ocean Blvd. The beach area was completely lacking in charm and reminded Justin of Laughlin, NV or the Bahamas (which he hated). We suddenly missed our old stomping grounds in Manhattan Beach, CA. Myrtle Beach was quite disappointing. It’s somewhat tragic because the coastal town has a lot of potential with nice houses and neighborhoods, but it dropped the ball on the commercial side. 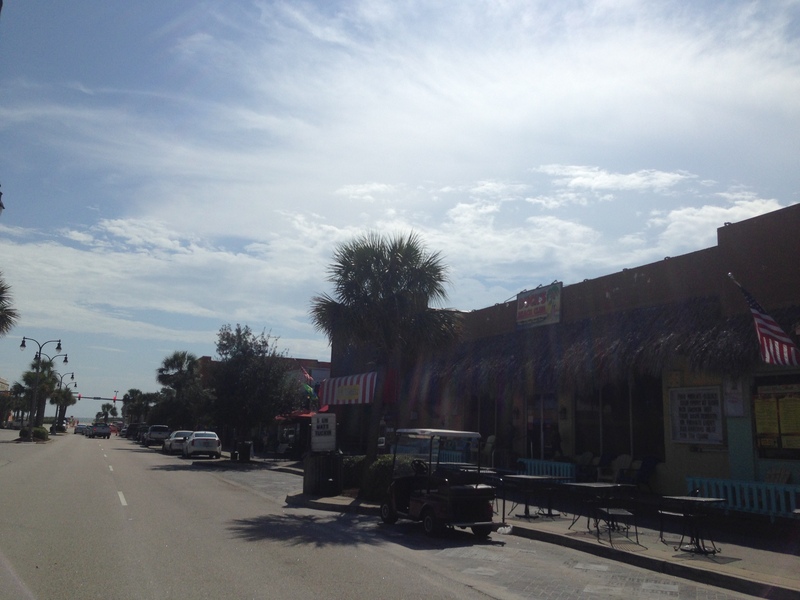 We continued driving through Atlantic Beach and headed up to North Myrtle Beach. The Main Street of North Myrtle Beach was the most eclectic area we saw, but that’s not saying much. 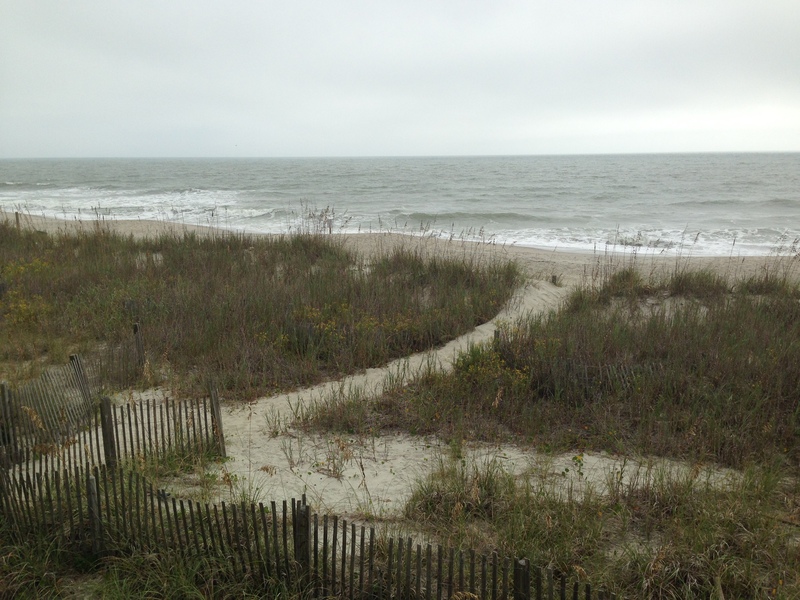 When we reached the end of the road in North Myrtle Beach, we parked and walked out to Cherry Grove Beach. On our way back to our campground, we stopped to have lunch at The Market Common. The outdoor shopping center had some upscale boutique shops and restaurants. This was what we expected to see by the actual beach and seemed like it must be the nice area of Myrtle Beach. We’ve experienced some crazy weather on this trip! Last night was up there with the tornado we almost experienced in Nebraska. There was a torrential rainstorm that seemed to last all night. With sheets of rain hammering the roof of the trailer and vicious winds rocking it back and forth, sleeping was impossible. Since we were on the East Coast, we were worried it was a hurricane, something we had never experienced before! Luckily, we survived the storm despite the nerve-wracking weather and lack of sleep. We were able to make up for lost shut-eye by sleeping in this morning. When we finally woke up and dared to look outside, there seemed to be at least an inch of rain on the ground. Even with all the precipitation throughout the night, Mother Nature wasn’t done. The rain continued during most of the day, forcing us to stay inside. Nonetheless, I used the rainy day to give the dogs a much-needed haircut. 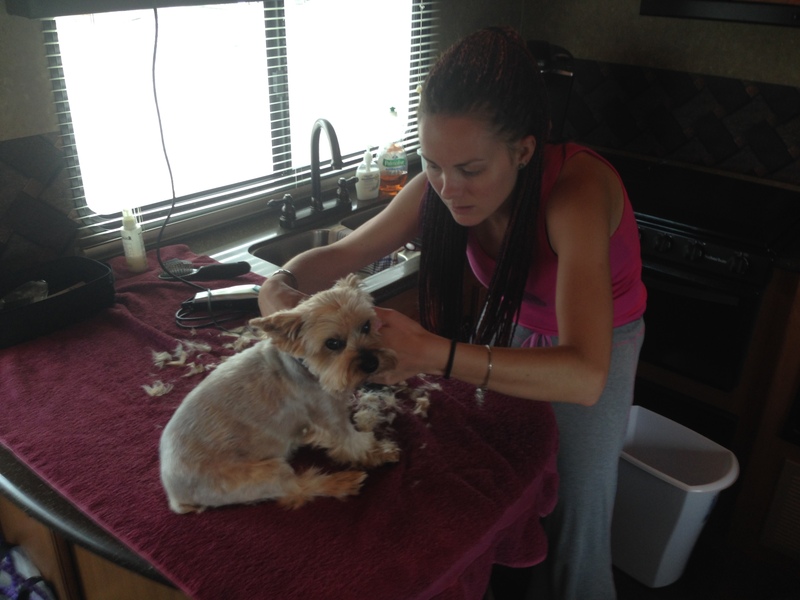 The trailer actually makes a decent dog grooming station. The rain eventually let up in the afternoon, so we jumped on the opportunity to go exploring. We ventured up to Conway, one of the oldest towns in South Carolina. The downtown historic district consisted of a few businesses along the primary road. From there, we took a short stroll to the nearby Waccamaw River and walked alongside the water on the River Walk. We loved the eerie trees lining the streets with moss dangling from them. Conway seemed as if time there passed at a slower pace. I could picture people sitting in rocking chairs on their front porch while drinking sweet tea and waving to their neighbors. While Conway had its charm, the small Southern town was much too small for us.